Qubt Minar is a large sandstone tower that was built in the 13th century just a few kilometers from Delhi. The large monument is one of the most visited sites in India. The Qubt complex on which the tower lies is located on the eastern part of Lalkot, one of the 7 cities of Delhi. The city was established by Anang Pal, the Tomar Rajput ruler in 1060. 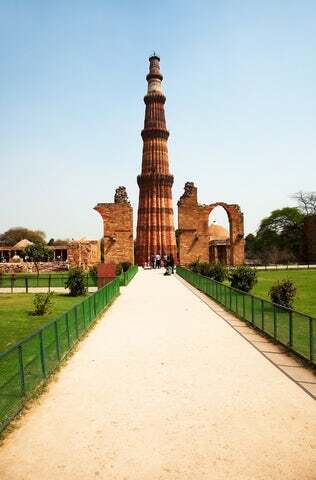 The Qubt Minar measures 72.5 meters high, 14.32 meters diameter at the base, and 2.75 meters at its tapering top. The surrounding area is home to several important monuments such as funerary buildings such as the Alai Darwaza Gate, mosques such as Quwwatu’l Islam that was built with materials from 20 Brahma temples. Construction of Quwwatu’l-Islam (Might of Islam) congregational mosque kicked off in earnest in 1192led by Qutbu’d Din Aibak. It would be completed in 1198. The temple was built using materials from demolished Hindu temples. The mosque was further enlarged by Iltutmish (1211-36) and again by Alauld-Din Khalji (1296-1316). 1202 - The Qutb Minar was also begun by Qutbu'd-Din Aibak, in around 1202 and completed by his successor, Muhammad-bin-Sam. 1503 - Sikandar Lodi carried out some restoration and enlargement of the upper storeys. The iron pillar in the mosque compound was brought from elsewhere in India. It bears a Sanskrit inscription from the 4th century AD describing the exploits of a ruler named Chandra, believed to be the Gupta King Chandragupta II (375-413). 1311 - Alai Darwaja was built by Alauld-Din Khalji, who also began the construction of the Alai Minar. There are a lot of other historical buildings and artifacts to be found within the Qubt complex. The site was inscribed into the UNESCO World Heritage Sites in 1993 to safe guard the interaction of the Hindu and Islamic religions in Delhi. Trust me; you will have a visual history lesson by visiting this site.